Please Help Me! Am I doing this right? Hi y'all. I'm fairly new to gardening. Let me give you a back story about my garden 2013. I live in Iowa. We're on clay soil. I HATE it. When wet, it's like slime and when dry, it's like the desert and gets cracked. As usual, the garden bed was rototilled early and ready to plant after the threat of frost. What I didn't expect was all the rain and flooding we got this year. My newly planted garden was completely flooded out and ruined. Nothing left to salvage. Again, I started seeds in the house as I just can't justify spending that amount of money on plants vs. buying at the store or farmers market. Now it's June 15 and I know it will be a very late harvest this year. I haven't done anything with the garden bed since the floods and it's full of ground covering weeds. Not horribly, but enough that I would want to rototill. I decided that in lieu of rototilling, I laid out newspaper and covered with grass clippings hubby saved for me. I wet the whole thing down and plan to bring in better dirt to go over this double layer pile. My thought is that it will help with the clay soil issue while killing the weeds underneath. 1. Do I need to keep the newspaper/grass layers wet and if so, always wet or allow to dry out in between? 2. When should I add the new soil to this pile? 3. Do I have to wait until the pile decomposes to plant my garden? Forgive the tire in the background. It's in my horse's pasture blocking them from stepping on a septic cover under the ground. Re: Please Help Me! Am I doing this right? Your going to add 25 or more full wheel barrows of horse manure to that clay gumbo per year, and it'll take 3 to 5 years to change it into top soil. So, when I bring in dirt next week, can I plant in it right away? Each year when I add the manure, can I plant in it? Do I add anything else besides manure? Typically the manure is from the run-in and also from my trailer, which has pine shavings in it so the manure is mixed with the shavings. Yes, if what you bring in is topsoil/ compost, you can plant in it right away. If you add well aged composted manure and mix it in, not too concentrated, you can plant in to it right away. If your manure is fresh, it needs to compost for a year, or be tilled in, in the fall and not planted until spring. Tom's seems like a pretty conservative estimate of when you can have good soil. Manure mixed with wood shavings is a pretty good start on a compost pile. Grass clippings by themselves in a thick layer could end up with same effect as too much grass clippings clumped together in a compost pile -- i.e. moldy slimy. 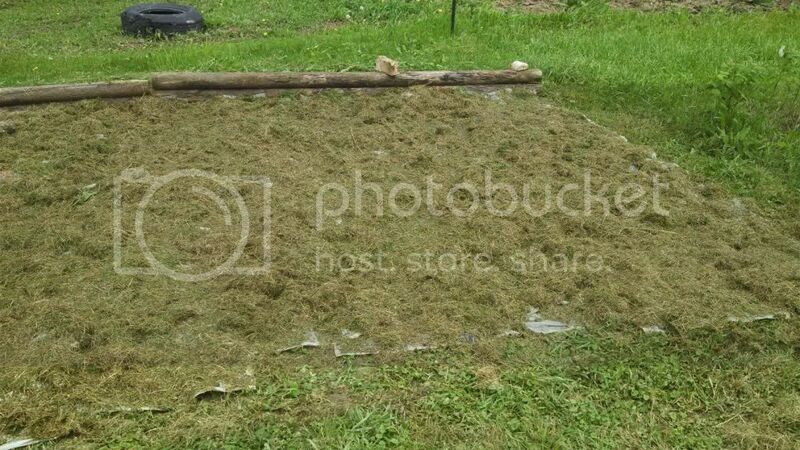 If the grass clippings are weed seed free but the compost/soil mix is suspect, then, I would have put the paper on top of the new compost soil mix then used the grass clippings mixed with some kind of browns (fall leaves, straw, etc. some people use shredded paper) as mulch on top of the paper. If you are pretty confident of the compost/soil mix, then go ahead and put it on top of the weed barrier paper. If you will have more grass clippings to use as mulch, then would definitely mix/layer some browns with the grass clippings you already layered on the paper, then put the soil compost mix on top of that, the paper again (or not) and mulch. I don't have any decomposed compost at present time. I am new to composting and just purchased a compost bin. I plan to have top soil brought in. Will that work to plant my started plants in? I agree with apple if you have too much greens and no browns when you sheet mulch, it might not only create slime as it decomposes, it might not be as light, fluffy and well aerated. You could layer greens and browns. Put your top soil, compost on top of the last layer and plant in that. You can usually get compost or compost mixed with soil from your local composting facility (municipal green waste contractor). It is usually cheaper if you buy it by the truckload and you provide the truck. You could add composted manure to that or other organic fertilizer and plant in that. It is the essence of lasagna gardening. I had five pumpkin plants and seven other plants consisting of 3 cucumber plants and 4 cantaloupe plants I HAD to get in the ground. They couldn't wait any longer. I pushed the grass away, made a hole the width of the plant roots/dirt combo and used some good garden soil to plant them. The soil we have in the garden plot now is literally like molding clay. If I had a kiln, I could make some awesome clay pots! I don't quite know how, but last year's garden did awesome in that clay. When it's dry, it gets big cracks in it and when it's wet, the water pools on top of it. It's just awful. I really, really need to find a way to make it a nice spot for my vegetables. What can I use for 'browns'? Would the pine wood shavings count as brown compost material? Edited: Okay, so wouldn't the layer of newspaper count as a "brown"? leaves, corn stalks and cobs, shredded black and white newspaper [not the slick papered advertisements or color print], crushed eggshell, cereal boxes, ashes from wood, paper and charcoal, wood chip, string and cotton thread, feathers (huh!) , old natural fibre clothes, wool, straw , hay. I have sawdust and ashes from our fire pit I can use. Do I just put a layer over the grass clippings? Another thing that came to mind is that I have a pretty large pile of grass clippings laying in a big pile by my compost bin. Should I move this somewhere? Will it get disgusting under that pile of grass clippings? Where could I store them for later use? And thank you so much for your help. I'm really a novice at this. Meanwhile, its not too late to plant (I didn't start till after July 4th when I was in Spokane--miserable cold place! I had a little over 90 days to grow.) You could use a round plastic"compost bin" to fill "lasagna style" (or fabric pots) & top with gardening soil mixed with bought compost (NOT potting soil) and let the layers break down for you while you're growing your veggies (all the while amending your soil and getting your composting going.) Biodynamic Gardening is good book and maybe just try small areas.."Square-foot gardening." Use some old wood to make a very small raised bed, maybe 3' x 3'. You'd be surprised how much you can get in there..especially if you can grow vertically, like lemon cucumbers, squash, tomatoes. I moved back to CA--a lot easier! Newspapers is a brown with a high carbon to nitrogen ratio. Pine shavings are also a brown. Don''t add too much wood ashes as it may alter the pH a little too much. If you have things already in the 30:1 C:N ratio range, it is the easiest material to add to compost to keep it balanced. Higher ratios will not decompose as fast, but lower ratios might consume much more nitrogen in the process. I have a similar problem as yourself. I have a large amount of ash from Mt. St. Helens and it does act a bit like clay. I like to mix in a good amount of Peat Moss. This will break up the soils ability to pack down and holds moisture really well. Till it in real good and replant your garden. Personally I would pull the grass and newspaper off into a compost pile and use it next year. Goodluck !! Tomatoes are the fruit of life. I'm going to make a compost pile and use the compost barrel for kitchen compost to keep the critters out of it. I'm a bit discouraged but I'm going to keep plugging away for now. I have strawberries and my herbs in big pots on the side porch and they're doing really, really well. You could put down newspaper, cover that with with 4 or 5 inches of compost, and then cover that with 5 or more inches of wood chips. By next spring you would be amazed at what you have. check out backtoedenfilm.com for a video. High Sunshine and welcome. I have fought the battle with clay soil in the past. In South Louisiana we call it gumbo soil. I had some success with a variety of amendments. Compost which was a balance of browns and greens including well aged manure and very coarse mason sand tilled into the soil. Fill sand and play sand is too fine and actually turns into clay. It took a lot of work and time to get the soil right. Even after the soil was in a state that I liked it required annual amending to keep it that way. I finally threw in the towel and started square foot gardening in raised boxes. Before adding planting mix put down commercial grade landscape cloth. It is woven - not felt. Also put down a thick layer of news paper or cardboard. Appliance boxes work great. Build your boxes and make a planting mix of 1/3 compost, 1/3 peat and 1/3 coarse horticulture vermiculite. I was a lot younger when I engaged Mother Nature in the battle of soil composition. I am too old to keep up the fight because in the long run Mother Nature ALWAYS wins. ElizabethB wrote: High Sunshine and welcome. I have fought the battle with clay soil in the past. In South Louisiana we call it gumbo soil. I had some success with a variety of amendments. Compost which was a balance of browns and greens including well aged manure and very coarse mason sand tilled into the soil. Fill sand and play sand is too fine and actually turns into clay. It took a lot of work and time to get the soil right. Even after the soil was in a state that I liked it required annual amending to keep it that way. I finally threw in the towel and started square foot gardening in raised boxes. Before adding planting mix put down commercial grade landscape cloth. It is woven - not felt. Also put down a thick layer of news paper or cardboard. Appliance boxes work great. Build your boxes and make a planting mix of 1/3 compost, 1/3 peat and 1/3 coarse horticulture vermiculite. Ah...funny you should mention the boxes! We decided that next year we will plant in raised garden beds! Great minds think alike!